GLENN (Glen, Glyn), JOHN, soldier, prospector, trader, and farmer; b. 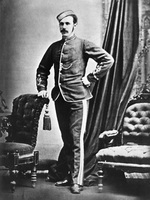 1833 in County Mayo (Republic of Ireland); d. 9 Jan. 1886 in Calgary (Alta). John Glenn was 16 when he emigrated to the United States. He was living in Waco, Tex., when the American Civil War started in 1861 and he became a Confederate soldier. However, he deserted in a protest against slavery and fought with the Union forces until the end of the war in 1865. He then began prospecting for gold and later claimed he had travelled from “the Rio Grande to the Peace River.” In 1872 he was traversing the Yellowhead Pass en route from the Cariboo (B.C.) 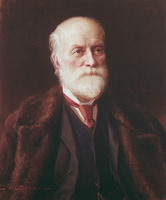 gold-fields when he met the expedition of Sandford Fleming* which was inspecting the proposed route for the Canadian Pacific Railway. A solitary traveller, Glenn greatly impressed the party with his “self reliant individualism” and courage. By the summer of 1873 Glenn was prospecting on the North Saskatchewan River. That September he married Adélaïde Belcourt, a Métis, at the Roman Catholic mission at St Albert near Fort Edmonton. During the next two years he developed a trading business with the Indians. While returning from Fort Benton (Mont.) in the fall of 1874 with his wagon of goods he overtook the first detachments of North-West Mounted Police to reach the northwest, and sold them such luxuries as flour and syrup at a “pretty stiff price.” In July 1875 he settled permanently on Fish Creek at its junction with the Bow River (Alta), and later that year, when the NWMP, led by Éphrem-A. Brisebois, arrived to establish Fort Calgary, he was on hand to build stone fireplaces in the barracks and to sell them hay. In 1876 Glenn and a man named Sam Livingston started farming, the first to do so in the area. Glenn sold his farm in 1879 to Indian commissioner Edgar Dewdney* who planned to operate it as a supply farm. The holdings, two log buildings and two small fields of oats and barley, together with a milk cow and calf, were sold for $360. Glenn then moved farther west and became a squatter on the south side of Fish Creek east of the Macleod trail crossing. It was here that Glenn instituted the first irrigation scheme on the Canadian prairies, locating his own point of diversion and laying out the system himself. It irrigated his fields and those of Samuel William Shaw who also used the diversion for the operation of a woollen mill. 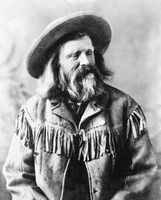 Glenn became an active, respected, and prosperous member of the Fort Calgary area. 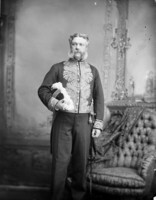 His farm was a “show place” which all visiting notables came to see, including the Marquess of Lorne [Campbell*] in 1881. Glenn was the first permanent local resident to purchase property in the CPR’s sale of lots for the townsite of Calgary in 1883 (the town of Calgary was incorporated in 1884) and he was a founder and vice-president of the Calgary District Agricultural Society in 1884. An unfailing champion of the country’s agricultural possibilities, he was an organizer, along with Livingston, of a protest meeting of settlers held on his own farm on 6 April 1885. The Alberta Settlers Rights Association was formed and strong resolutions were drafted and directed to Ottawa protesting regulations governing range leases, homestead restrictions, Métis grievances, and the lack of western representation in government. On 17 Oct. 1885 Glenn was injured in an accident caused by a runaway team of horses. He died a few months later, leaving his widow and six children. Glenbow-Alberta Institute, Canada North West Land Company papers, CPR townsite sales books, XXIV; Simon John Clarke diaries, 1876–86; Frank M. Crosby papers, 1863–84; Patrick and William Glenn, “Biography of John Glenn, pioneer of pioneers (of Calgary and Mindapore district from 1873 to 1886)”; Irrigation papers, W. L. Jacobson project, 1961–64, f.167; Samuel W. Shaw papers, 1885–98. Calgary District Agricultural Soc., District of Alberta: information for intending settlers (Ottawa, 1884). Can., Parl., Sessional papers, 1879, VI: no.7. G. M. Grant, Ocean to ocean: Sandford Fleming’s expedition through Canada in 1872 . . . (Toronto and London, 1873; repr. Toronto, 1970), 267–68. Calgary Herald, 1883–86. Globe, 4 April 1885. Macleod Gazette and Alberta Livestock Record (Fort Macleod, [Alta. ]), 1882–86. 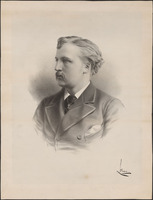 J.[C.] McDougall, On western trails in the early seventies: frontier pioneer life in the Canadian north-west (Toronto, 1911). Sheilagh S. Jameson, “GLENN, JOHN,” in Dictionary of Canadian Biography, vol. 11, University of Toronto/Université Laval, 2003–, accessed April 26, 2019, http://www.biographi.ca/en/bio/glenn_john_11E.html.